I had the privilege of trying the Art Project That Begins With a Black Line in a plein aire setting. A family from Ohio was visiting Zion National Park. Months in advance the very wise and energetic mother of 7 had arranged with the park for personalized art instruction for two of her children, girls, 11 and 14. Park officials found me through word of mouth and I was happy to do it. For two hours we looked at one of the main features of Zion National Park, the Watchman rock formation. We looked for straight, diagonal, squiggly lines. Discussed colors and their complements, lights and darks, shapes, and the freedom of expression. For example: The sky can be any color you want it to be, but, consider that if you want it to look like “the sky” you need to make sure the value or lightness in color of the sky looks like sky compared to the mountain. Hence, a light pink sky. The light side of the Watchman mountain was one of the primary colors and the dark side was its complement. Then we anchored the mountain to the ground with a darker value color and added texture. 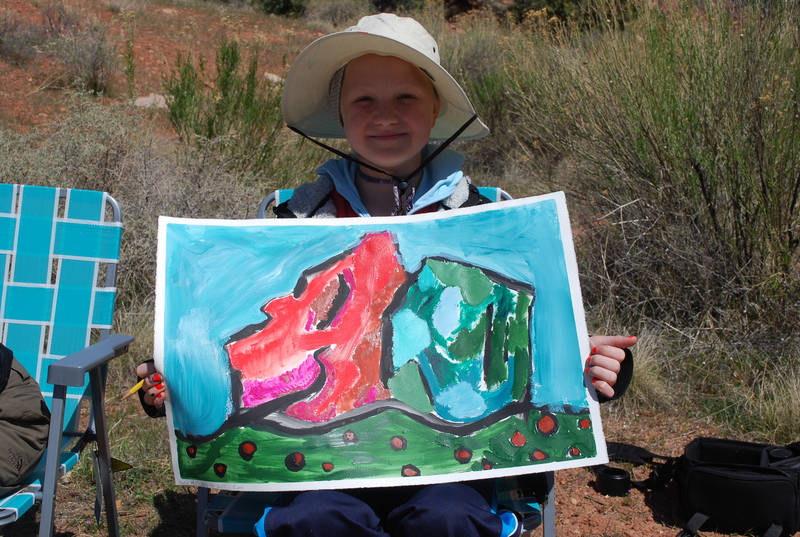 Altogether we explored art elements and really looked at the very mountains and rocks they had come to see while visiting the park. They were great young artists to work with. This entry was posted on April 7, 2012 by dilleenmarshwomanartistrenaissance. It was filed under Uncategorized .